We – “we” meaning all Americans who still believe we are united as a nation that cares for our own – face an apocalyptic nightmare scenario. In Hollywood, the apocalypse that threatens lives is always averted by noble heroism, collective altruism, and last minute good luck. But this nightmare is real and won’t wrap up inside of two hours. Our reality is rooted in an executive in chief who is willing to play and gamble with people’s lives. Our nightmare is that Americans are nothing but pawns to him so long as he can get what he wants. The longest government shutdown is over, but Donald Trump showed in that time that he was fine with jeopardizing families and children and this country’s economic prospects. 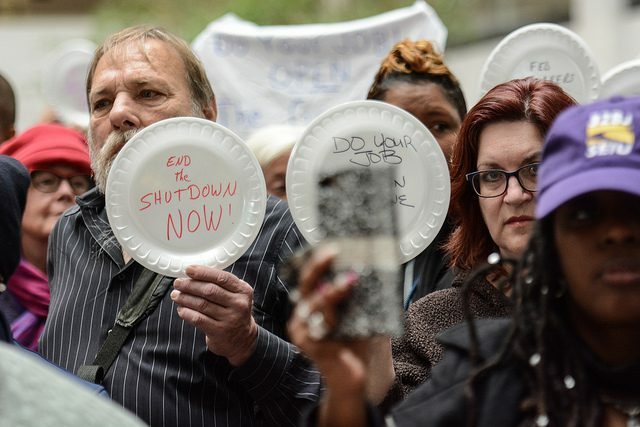 The prolonged shutdown left 800,000 federal employees and their families without an income and threatened Americans to go without food assistance, college tuition, housing or healthcare. And all because of Trump’s insistence on a $5 billion “border wall” that experts agree will not have a positive impact. Trump’s wall demeans the American dream, and symbolizes xenophobia. Trump’s wall will provide Americans with no additional safety protections. Trump’s wall ignores that migrant crossings at the border with Mexico has declined drastically over the past 20 years. Trump’s wall announces to the world that America is committed to racist stereotypes rather than compassion and justice. Trump’s wall encourages the perception that we are a militant and entrenched nation where fear and distrust have replaced policy-making and diplomacy. It is another in his attacks against brown people, from his racist comments about Mexicans to his efforts to revoke protections for Dreamers. Now, he tried to blackmail the nation into building his wall. During the shutdown, Trump “appeared unmoved by the plight of Americans suffering. But why should party affiliation matter to a president who claims that his primary motivation for building a wall is “national security”? And – worse – how can he invoke “national security” when the wall offers no more than illusory security, and his intransigence risked creating chaos and calamity in his own country? What could happen next? Trump has to see reason so we can avert another shutdown. Because can we imagine President Trump still smirking while the streets fill with millions of additional indigent Americans? Can we imagine the president still smirking, or behaving childishly while an impoverished woman who needs Medicaid to fund a life-saving surgery lies slowing wasting away? The hour may arrive when we won’t have to use our imaginations. The president’s choices have already revealed his willingness to let millions of Americans become sacrificial lambs to his pursuit of a wall. In the movies, apocalypses can be prevented by discovering a secret weapon or a new spirit of cooperation among the hurt and the wounded. It’s past time to begin using our own secret weapon. We won’t need masterminds or heroes to find it. There will be a few obstacles. But primarily we will need conviction. We will need a willingness to stand together. We need to create a massive wall of voters. In national elections, only roughly 60 percent of the eligible voter population participates. The turn-out statistics in midterm elections are lower; sometimes only four of every ten eligible voters cast ballots. The US trails every other major democracy in voter turnout. Using the power of the ballot, we can elect leaders who will protect the safety net, leaders who will view housing assistance, Medicaid, and the plight of working Americans on the same level as protections enshrined in the Bill of Rights. The secret weapon is not a secret. And the way ahead lies in realizing we cannot afford cynicism, or apathy. And we can beat clever Republican-sponsored voter disenfranchisement laws with an overwhelming surge in voting numbers. We can even dampen the influence of excess money in politics. We can watch politicians gamble our lives away. Or we can use our secret weapon. And I know that, in 2020, we will. I fear Nevada – and our entire country – is treading on its racist history. Our president’s mantra is to “make America great again.” Many of us interpret this campaign slogan as a desire to return to the past, a time when White men ruled and White supremacists terrorized people of color.